This is our third week of Virtual Book Club Summer Camp and it is WATER WEEK! Each post will feature water activities and children's books related to water. If you're not yet subscribed to our weekly camp emails, go here to sign up. Swimmy by Leo Lionni is a beautiful book that teaches kids about teamwork and friendship. I loved using it when I taught elementary school and enjoy sharing it with my own kids now. 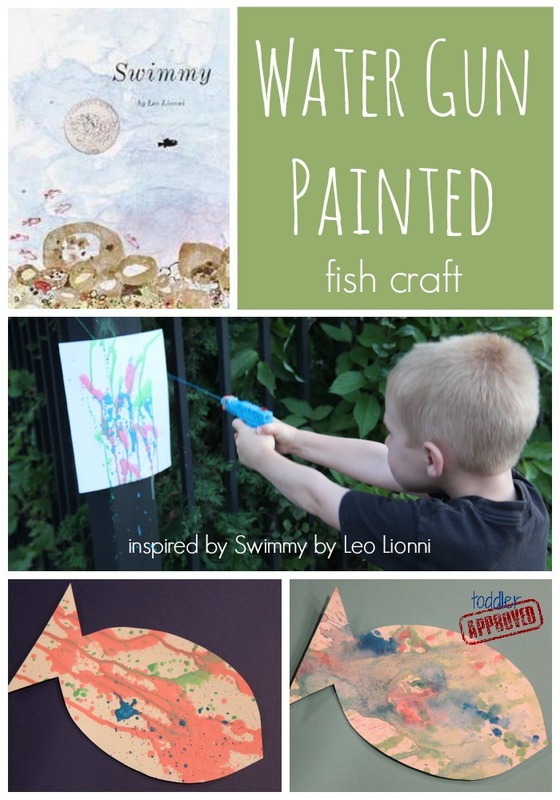 For our featured book-inspired activity today, we created a water gun painted fish craft. The illustrations in Swimmy are done with watercolors, so instead of doing typical watercolor painting, we added water and paint to our water guns and we created some very colorful fish! Materials Needed: water guns (or spray bottles), a cup or two of water, washable paint (or liquid watercolor), cardstock, painters tape, and scissors. First we taped some cardstock up on a fence outside. I wanted to have the paper ready ahead of time because I knew once the water guns were filled the kids would want to start painting immediately... and I was right! Next we added some water and washable paint to the water guns. My husband helped with this and my son was our water carrier. Once the water and paint is added (more paint than water), it needs to be thoroughly shaken so that it loosens up and can move easily inside the water gun. Once the water guns start shooting the paint properly... just pass them off to your little artists and tell them to start creating their masterpieces on cardstock! We had a different color paint in each water gun and we stuck to only three colors. I loved to see how the colors mixed and dripped. This activity was a hit. We only had thirty minutes to do it and we needed a lot longer! We will be doing it again later this week! We also put some cardstock on the ground and squirted the color down there too. The paint moved differently and that was fun to watch. Once the masterpieces were created, we let them dry while we cleaned up. As you could imagine, the kids sprayed things other than the paper. We made sure to have baby wipes on hand to clean up. *It is critical that you use WASHABLE paint for this activity or else the paint won't come off the surfaces where you paint. We did this activity OUTSIDE so that we did less damage. :) I highly recommend doing that. If you have large paper to use, grab that instead of small pieces of cardstock. We were visiting my mom when we did this project, so we didn't have access to some of our usual materials... like large pieces of butcher paper. After the paintings are dry, use a fish stencil to help you cut the masterpieces into fish shapes. The adult can cut the fish or older preschoolers can cut for themselves. Then you can keep things simple and just mount the artwork on colored paper... or get a bit more creative and stuff your fish (like these featured at The Crafty Crow) and hang them. Either way, displaying these colorful fish will remind your child of the fun water activity you did as well as the darling book you read together! What are your favorite unique painting tools? 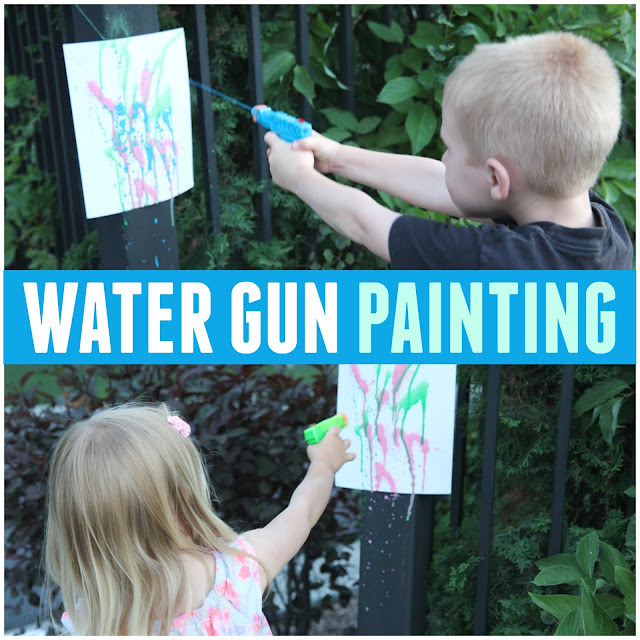 Have you painted with a water gun before? Make sure to come back tomorrow to see the other "water week" activities we are sharing and also head over to The Educators' Spin On It for their VBC Summer Camp featured post. Don't forget to enter our "water week" giveaways from Kids Yoga Stories, Steve Spangler Science, and Today I Ate a Rainbow. Go here for more details! You can find other Leo Lionni inspired blog posts here in our Leo Lionni Virtual Book Club for Kids link up... including our SPLAT water game inspired by Colors, Numbers, Letters.